Precision feed controls provide an exact speed control for machine movement. 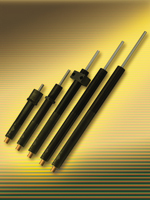 They are self-contained, maintenance-free, leak proof, temperature stable and stick-slip-free with fine adjustment. The proven rolling diaphragm seal provides a hermetically sealed unit and an integral accumulator for the oil displaced during the operation. The high precision adjustable metering system can provide accurate feed rates from as little as 12 mm/min with low propelling forces. The displaced oil volume is forced through the adjustable precision metering orifice, providing a constant and precise feed control throughout the stroke.